This book develops a theory of international cooperation to address transnational, regional, and global environmental problems--basically, a theory of treaty design. The book motivates the theory (which is grounded in simple game theory but structured so as to reflect important features of international relations and international law) and tests it out informally by presenting evidence from numerous past successes and failures. A primary aim of the book is to explain the apparent success of the Montreal Protocol in protecting the ozone layer--in the belief and expectation that, if this success can be explained, then the logic underlying the explanation can be applied to other issues. As argued in the last chapter, the theory suggests that the reason cooperation on climate change has failed is that countries have relentlessly pursued the wrong approach. This book shows why multilateralism is needed and explains how multilateralism can succeed. The focus here is on global public goods. Examples include: prevention of an asteroid strike, nuclear testing and non-proliferation, infectious disease eradication, big science research, financing of the United Nations, the standard for determining the time, tsunami warning systems, surveillance of emerging infectious diseases, prevention of pollution of the oceans, and the governance of new technologies including inheritable genetic modification and solar geoengineering. 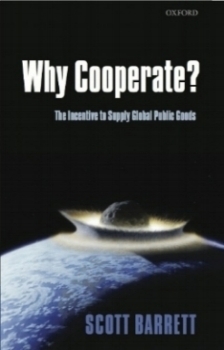 The book shows that different issues share common features and so can be addressed in similar ways, and grew out of my work as an advisor to the International Task Force on Global Public Goods. Unlike the first book, this one is presented in narrative form--no formal models.